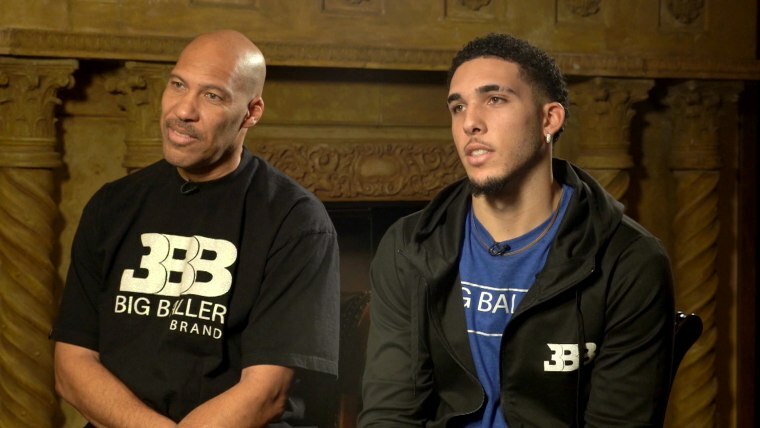 The father of UCLA basketball player LiAngelo Ball still isn't crediting President Donald Trump with helping to free his son after his arrest in China — but LaVar Ball did send the president a cheeky gift from his sports apparel line. Ever the promoter, LaVar Ball told "Today" on Tuesday that while he refuses to thank Trump, he mailed a few pairs of Big Baller Brand sneakers to the White House. "I sent him three pair — red, white, and blue — to show him we patriotic," Ball said. LiAngelo Ball, 18, was one of three UCLA team members detained in China on suspicion of shoplifting last month, a day before Trump arrived overseas to meet with Chinese President Xi Jinping. On the morning of the players' release, Trump told reporters he "had a great conversation" with his Chinese counterpart about letting them return home. While all three basketball players thanked Trump at a news conference once they were back on U.S. soil, LaVar Ball has played down Trump's role in bringing them home, prompting furious tweets from the president. "It wasn't the White House, it wasn't the State Department, it wasn't father LaVar's so-called people on the ground in China that got his son out of a long term prison sentence - IT WAS ME," Trump tweeted on Nov. 22. "Too bad! LaVar is just a poor man's version of Don King, but without the hair." Speaking with "Today" after announcing that he is withdrawing LiAngelo from UCLA, the elder Ball insisted there was no reason to thank Trump. "I don't just be saying thank you because somebody said they did something. And if they did it, genuinely, do you really need to come up to me and say, 'Boy, you better thank me?'" LaVar Ball said. The shoes, known as ZO2s, were not an expression of gratitude, he added, but rather a way of making Trump's "blood pressure go down." "I sent him some shoes to calm him down. ZO2s bring you down, stop you from getting all riled up," he said. "That's why I gave him the shoes. I said it's gonna help him out — it's gonna make his blood pressure go down. He don't have to worry about all that. Put some ZO2s on and walk light." As the patriarch of a high-profile family whose lives are profiled on the Facebook reality series "Ball in the Family," Ball is no stranger to the limelight. His other sons are also basketball players: Lonzo is a point guard for the Los Angeles Lakers and LaMelo is a high school ball player. LiAngelo, a college freshman, told "Today" that being jailed in China was "horrible." He said he agreed with his father's decision to pull him out of UCLA after the university slapped him and the other two players involved in the shoplifting incident with a suspension. "Well, I just want to play basketball, so whatever decision he makes, I trust it," he said. The two- to three-month suspension from UCLA is "the whole season pretty much," he added. "That's just a long time of doing nothing. I'd rather be playing." LiAngelo, who is considered a long shot to be drafted, will instead focus on his NBA prospects, his father said. "It's going to happen," he said. "He's gonna make money playing basketball. That's just what it's gonna be — his last name is Ball. We gonna ball till we fall."